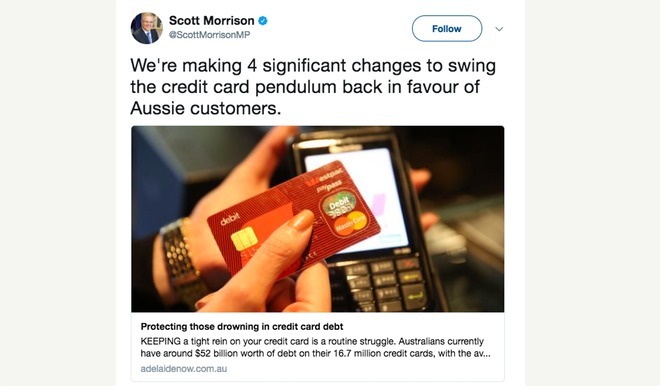 Just ahead of the introduction of new RBA credit card interchange fee caps, Treasurer Scott Morrison has come out with a set of four reforms set to tackle mounting credit card debt among Aussie households. According to Morrison, there are currently 16.7 million credit cards in Australia, with an average balance of $4,730 on each one. That leaves Aussie spenders nursing a combined credit card debt of $52 billion. Morrison said the Government would be making “four significant changes” to the way Aussies are sold and use their credit cards. Under the current rules, Aussies can get their hands on a credit card as long as they can demonstrate the ability to meet the minimum repayments. Scott Morrison suggested that this has left customers with debt and excessive interest charges they weren’t prepared to manage or pay down. Second, “unsolicited offers of credit limit increases” will be prohibited across all types of communication. Card issuers are already banned from offering increased credit limits in paper form unless the cardholder had already agreed to receive such offers. The loophole was that providers could make those same offers electronically or over the phone with no penalty. “When you’ve got bills piling up and your wages aren’t budging, an out-of-the-blue proposal to lift your credit card limit can look pretty attractive,” Morrison wrote. Third, the way interest is calculated will be simplified, so that interest can only be charged from the end of the statement period on the amount outstanding. This replaces a system where if a customer does not clear their entire bill before the interest free period ends, they are charged interest on the remaining balance from the date of purchase. “...Most consumers have no idea how interest charges apply, and therefore incur heavy interest charges after the interest-free period when their balance is not paid in full,” Morrison wrote. The fourth reform will make cancelling a credit card or reducing a credit limit online easier by requiring card providers to make cancelling a card online an option. At the moment, if cardholders want to do either of those things, they need to visit a bank branch, which, Morrison wrote, may discourage cardholders from doing so. But Aussies may not understand the impact of credit cards as well as we think - a recent survey from online bank ME showed that 60% of Australians failed a basic financial literacy test. One of the concepts that tripped up a massive 73% of Aussies was that making only minimum repayments on a credit card would result in carrying a debt for decades. About the reforms, ME Head of Deposits and Transactional Banking, Nic Emery, said three out of the four would help cardholders, while the new affordability assessments would ultimately only serve to hinder competitiveness in the credit card market. “Most people get into serious credit card debt because of an unexpected event, like loss of employment, which the new affordability assessment won’t and can’t predict,” he said. ME has been calling for reforms to credit cards since 2016, suggesting changes that include requiring comparison rates to be shown on credit cards, as they are for home loans, making switching credit cards easier and raising the minimum monthly repayment amount. “While credit cards are a modern convenience, offers have become too confusing and standardisation is required. There are dozens of credit cards in the market that apply different fees and use different interest rate calculations, making it difficult for customers to accurately compare,” said Emery. One way to compare credit cards is with Mozo’s credit card comparison tool, which can help you find the right piece of plastic, whether you’re looking for a balance transfer, rewards earning power or low-interest spending.